One frantic actor’s struggle to come to terms with trying to change the world alone. 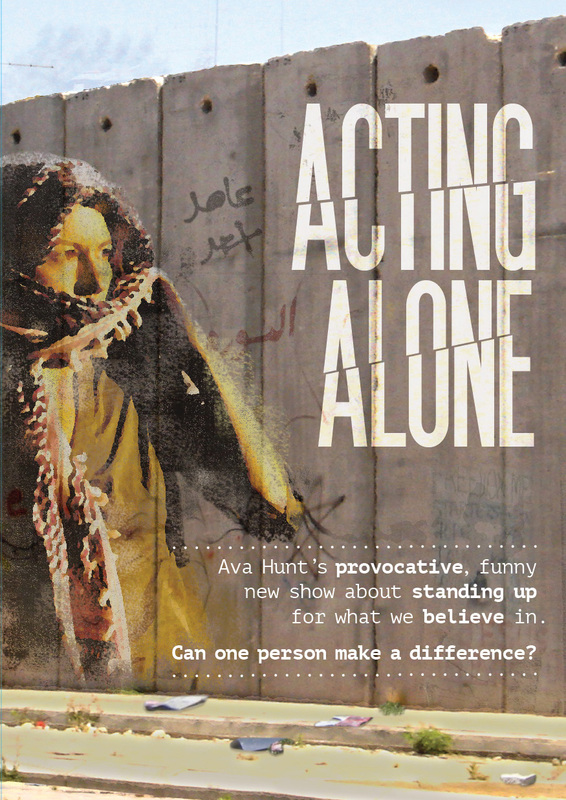 Acting Alone is inspired by the people Ava Hunt met on a visit to the West Bank and to Tel Aviv. In her unique performance style, Ava weaves together stories of immense complexity and fragile humanity. Heartbreaking, witty and confronting, Acting Alone asks questions of us all. Do we stand up for what we believe in? What are we willing to risk? Find out what inspired Ava to go to Palestine, and what happened in the middle of the desert when she got there. Tuesday 10th November 2015- Performance of Hope Conference, International Applied Theatre Symposium, Auckland, New Zealand. Friday 10th and Saturday 11th June 2016, Brockley Jack, London. For tickets click here. 5th, 6th, 9th, 10th and 12th August 2016 – Edinburgh Fringe Festival. Details here. 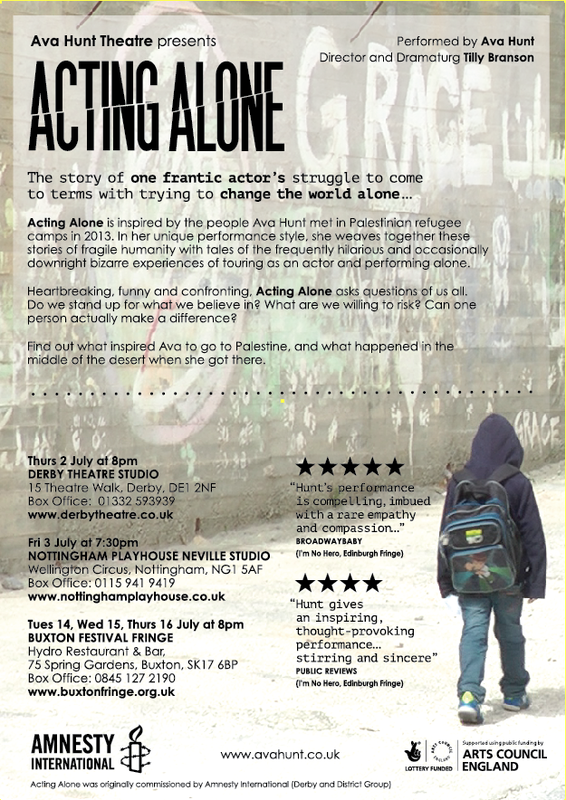 Originally commissioned by Amnesty International and performed at Wirksworth Festival in 2014. “a poignant, witty, and compellingly thought-provoking one-woman piece that defies all norms…This provocative performance is simply essential for all of us. *****” (Edinburgh Fringe 2016 review. Read full review here. “thought-provoking reflections… Ava… speaks powerful words of wisdom with an extraordinary level of understanding… More than just storytelling, more than a play, quite an experience”. Read full review here. “a highlight of the symposium… your performance had such an impact on the many delegates that attended”, Dr Molly Mullen, conference convenor, Performance of Hope, New Zealand. “We are delighted that the Arts Council England grant will enable more audiences to see Acting Alone – engaging from the onset, provocative, entertaining and motivating possessing the question what can an individual do in the face of injustice?” Paul Webb, Vice-Chair, Wirksworth and District Amnesty International Group.